Josiah Morrow appreciates that his peers are learning sign language to communicate with him. Two years ago, Josiah Morrow was the only deaf student at school. He'd use sign language with friends, but few could sign back. He learned from teachers for the deaf, but none stayed in the building full-time. There, at Finch Elementary, his loss of hearing seemed to limit his friendships and his schooling, says his mom, Corrine Morrow. "He was all alone," she says. But last year, Josiah transferred to a new program offered by Spokane Public Schools at Franklin Elementary. It accepts students with hearing loss from all over the Spokane area, providing specialized instruction and a place where students like Josiah can converse with their peers. And now, with more than a dozen students who are deaf or hard of hearing there, the rest of the school is picking up the signs. Josiah uses American Sign Language not only with students in the deaf education program, but also with the mainstream students and teachers. "They're trying to learn some sign language so they can communicate with me," Josiah tells the Inlander, through an interpreter. "I really like it." He's no longer the only deaf student at his school. And with more students like Josiah there, the other students and teachers at Franklin are adopting the language and culture. "Franklin," Corrine Morrow says, "is providing a connection with community so these kids can grow." Jin Omar came to Franklin with no language skills but can now hold a conversation. When Franklin principal Buz Hollingsworth sees teacher Dennis Matthews, he greets him with a sign. In the last year, Hollingsworth, like other teachers and students, has learned basic signs to communicate with students and teachers in the deaf-ed program. "I'm trying," says Hollingsworth, joking about the basic signs he's learned. "Dennis is very gracious and patient with me as I butcher his language daily." Students in the program switch between one of the rooms dedicated to deaf education and the mainstream classrooms. Josiah, for example, spends a majority of his time in class with the other sixth-graders. He occasionally checks back in with the resource room for instructional goals and language development catered to his needs. The teachers in the mainstream rooms have learned to slow down lesson plans a little bit, Hollingsworth says. And an interpreter in class makes sure Josiah can understand what the teacher is saying. The students in the program talk to each other without an interpreter, something they may not get to do if they're not in a school with other deaf students. It's nice for them to talk without an adult there, after all, says Michelle Gwinn, Spokane Public Schools special education coordinator. "If there's a language facilitator, they think, 'Oh, there's an adult here. I can't talk about the same types of things,' so being able to talk peer-to-peer is a much different experience," Gwinn says. But the other students at Franklin have been trying to talk to them, too. At recess, Hollingsworth sees the mainstream students interact with the students in the deaf-ed program. Eventually, students like Molly Wethered, a sixth-grader, start to learn the language. "It's awesome having them around because you get to learn new signs and learn something that you didn't think you'd ever really learn," she says. "Learning how to sign is a lot of fun because it's a new way to speak." It makes it easier for students to transition away from the deaf-education classroom, which is the main goal of it in the first place, Matthews says. 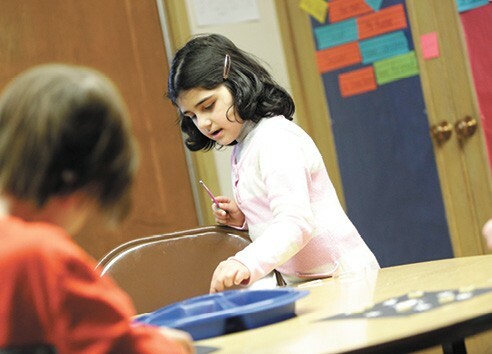 Some students, like Jin, a 7-year-old Syrian refugee, may come to the program with no language at all — she didn't know sign language or English. She mostly stays in the deaf-ed resource room, and in the span of one year she's learned enough to be able to understand and converse with others using sign language. "She came with nothing," Gwinn says, "and she's made several years' worth of growth." Corrine Morrow says she and other parents asked for a program that could better serve deaf and hard of hearing students in Eastern Washington years ago. Before, deaf students could try the Washington State School for the Deaf, but that's across the state. Or they could do what Josiah did and attend a school that may have no other deaf students around. The program is the result of a four-year study with the Center for Childhood Deafness and Hearing Loss. Already, other local school districts — Deer Park, Medical Lake, East Valley, Reardan — recognize its benefits and are sending students to Franklin. There are more than 300 students in Spokane Public Schools who have some type of hearing loss, and many don't need a program like the one at Franklin. But for those who do, it fills a longstanding need. 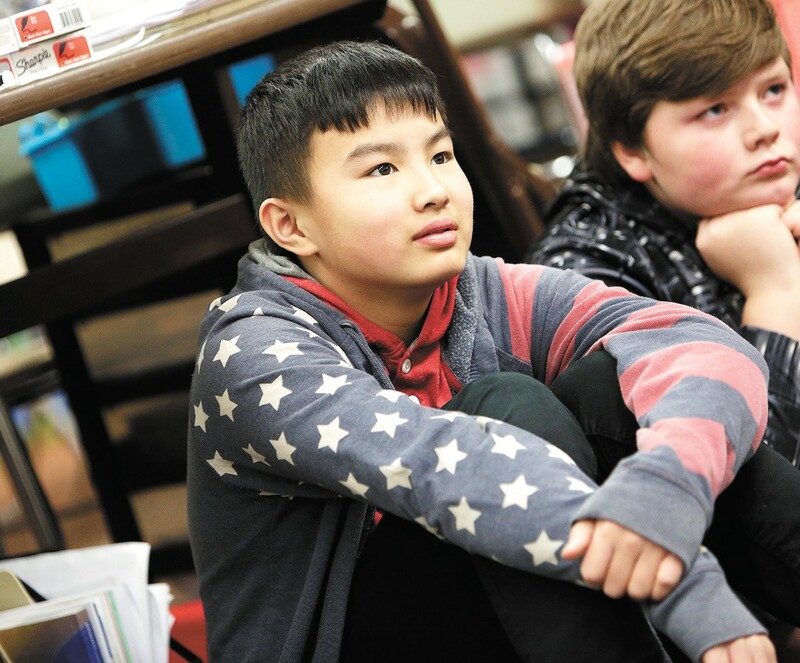 "I'm really grateful that Spokane Public Schools recognized this need and was willing to dive deep into it and see if it was something they could do," Morrow says. The district hopes to expand the program to middle school next year, keeping up with students like Josiah currently in the sixth grade. With such a positive response from the community at Franklin, the district has high hopes that deaf education will get a similar response in other schools. For Morrow, that's just as important as academic benefits for her son. But it goes both ways, Hollingsworth says. Franklin may be home to a program that uniquely provides education and community to deaf and hard of hearing students in Eastern Washington, but the rest of the school has learned something too, he says. They've learned some of the language, and they've learned from the culture of the students in deaf education. The original print version of this article was headlined "Reading the Signs"